Tip: Want a smooth, interruption-free installation? Better download Firefox Developer Edition offline installer latest version instead of using the typical online installer. Here is the direct link to download the exe file (firefox-35.0a2.en-US.win32.installer.exe). For those who don’t know, Mozilla announced a few days back that it will be releasing a new browser for developers ‘soon’. While it’s not a new browser but its a new version of Firefox Aurora that has been redesigned and launched as Firefox Developer Edition version 35. Mozilla has always had pre-release Alpha and Beta channels that allowed developers to download the upcoming versions of Firefox to test their add-ons and websites. Now, it appears that, the alpha / Aurora version has been rebranded as Firefox Developer Edition. 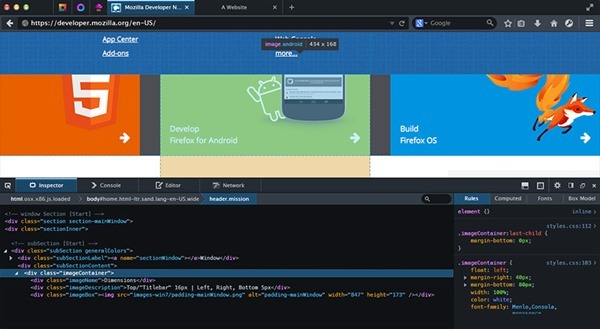 WebIDE: Develop, deploy and debug Firefox OS apps directly in your browser, or on a Firefox OS device, with this tool that replaces App Manager. Responsive Design View: See how your Website or Web app will look on different screen sizes without changing the size of your browser window. Valence: Develop and debug your apps across multiple browsers and devices with this powerful extension that comes pre-installed with Firefox Developer Edition. Page Inspector: Examine the HTML and CSS of any Web page and easily modify the structure and layout of a page. Network Monitor: See all the network requests your browser makes, how long each request takes and details of each request. Style Editor: View and edit CSS styles associated with a Web page, create new ones and apply existing CSS stylesheets to any page.